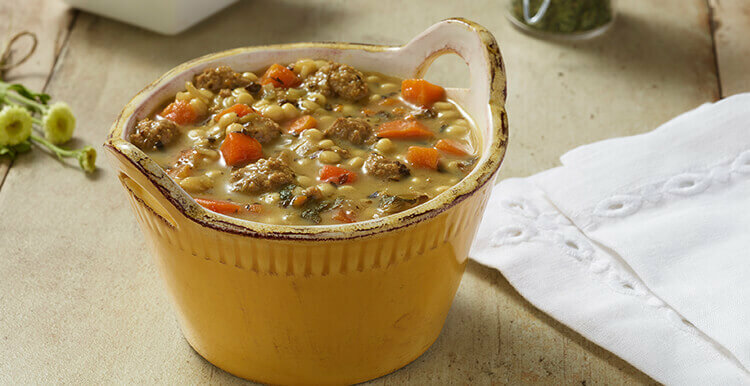 This classic Italian inspired soup combines hearty meatballs, carrots, pasta and spinach — all simply bursting with rich flavor. That's amore! Ingredients: INGREDIENTS: WATER, COOKED ITALIAN STYLE MEATBALLS (BEEF, WATER, TEXTURED VEGETABLE PROTEIN [SOY FLOUR, CARAMEL COLOR], BREAD CRUMBS [BLEACHED WHEAT FLOUR, DEXTROSE, LESS THAN 2% SALT, YEAST], LESS THAN 2% SPICES [INCLUDING FENNEL], NATURAL FLAVOR, DRIED ONION, DEXTROSE, SALT, YEAST EXTRACT, SODIUM PHOSPHATE), CARROTS, PASTA (DURUM SEMOLINA [ENRICHED WITH NIACIN, FERROUS SULFATE, THIAMIN MONONITRATE, RIBOFLAVIN, FOLIC ACID], EGG WHITES), SPINACH, MODIFIED CORN STARCH, ISOLATED SOY PROTEIN, CHICKEN FAT, DRIED ONIONS, CHICKEN BASE (CHICKEN MEAT INCLUDING CHICKEN JUICES, HYDROLYZED SOY AND CORN PROTEIN, POTATO FLOUR, FLAVORINGS, AUTOLYZED YEAST EXTRACT, CARROT POWDER, TURMERIC), MALTODEXTRIN, YEAST EXTRACT, LEMON JUICE, PARMESAN CHEESE (MILK, CHEESE CULTURE, SALT, ENZYMES), SEA SALT (POTASSIUM CHLORIDE, SEA SALT, MAGNESIUM), SPICE, GARLIC POWDER, ONION POWDER, TURMERIC OLEORESIN COLOR. Nutrients: INGREDIENTS: WATER, COOKED ITALIAN STYLE MEATBALLS (BEEF, WATER, TEXTURED VEGETABLE PROTEIN [SOY FLOUR, CARAMEL COLOR], BREAD CRUMBS [BLEACHED WHEAT FLOUR, DEXTROSE, LESS THAN 2% SALT, YEAST], LESS THAN 2% SPICES [INCLUDING FENNEL], NATURAL FLAVOR, DRIED ONION, DEXTROSE, SALT, YEAST EXTRACT, SODIUM PHOSPHATE), CARROTS, PASTA (DURUM SEMOLINA [ENRICHED WITH NIACIN, FERROUS SULFATE, THIAMIN MONONITRATE, RIBOFLAVIN, FOLIC ACID], EGG WHITES), SPINACH, MODIFIED CORN STARCH, ISOLATED SOY PROTEIN, CHICKEN FAT, DRIED ONIONS, CHICKEN BASE (CHICKEN MEAT INCLUDING CHICKEN JUICES, HYDROLYZED SOY AND CORN PROTEIN, POTATO FLOUR, FLAVORINGS, AUTOLYZED YEAST EXTRACT, CARROT POWDER, TURMERIC), MALTODEXTRIN, YEAST EXTRACT, LEMON JUICE, PARMESAN CHEESE (MILK, CHEESE CULTURE, SALT, ENZYMES), SEA SALT (POTASSIUM CHLORIDE, SEA SALT, MAGNESIUM), SPICE, GARLIC POWDER, ONION POWDER, TURMERIC OLEORESIN COLOR.